If you use Freightview often, you probably have already noticed that we made some changes to our rate list. We tried to keep the way it worked the same because we know how important the rate list is to the workflow of Freightview. It’s the original magic that started this whole thing. But, we wanted to make it even better. Aside from the new paint job, the first difference you’ll probably notice compared to the old rate list, is the lack of the featured rates across the top. We’ve kind of always thought that those “featured rates” made it feel like we were the ones providing those rates, at least to new users. We take our brand promise of neutrality seriously and we consider it a competitive advantage, so we wanted to eliminate any confusion on where those rates come from. Plus, the cheapest rates were already just the first three rates on the list below. The only real benefit to having these four rates featured, other than serving as eye candy was really the ability to see your fastest rate. And who only wants to see their one fastest rate? Wouldn’t it be better if you could see your rate list sorted by fastest delivery? So, we replaced the four featured rates with the ability to sort your entire rate list based on transit time. The rate list will sort itself as new rates come in, so if you know you need a quick delivery, you don’t need to wait for all of your rates to return to change how you see this list. The real value that we’ve added to the rate list is the ability to see the breakdown of charges associated with each rate. 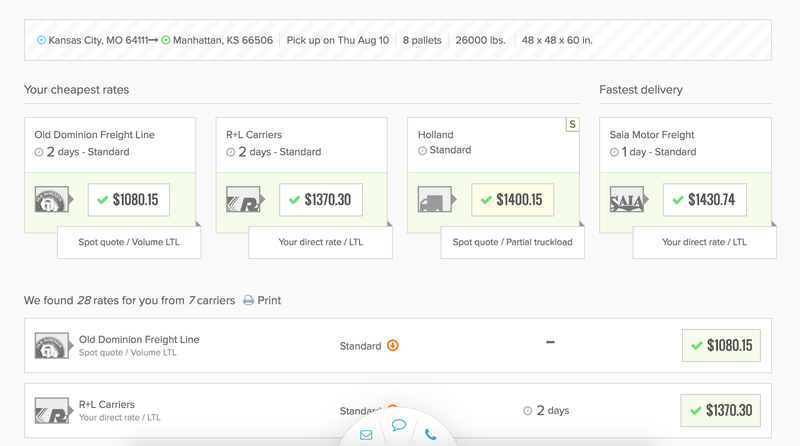 This has been one of our most requested features from customers and we think it forms the foundation for us to help you dig into your freight costs even further in the future. 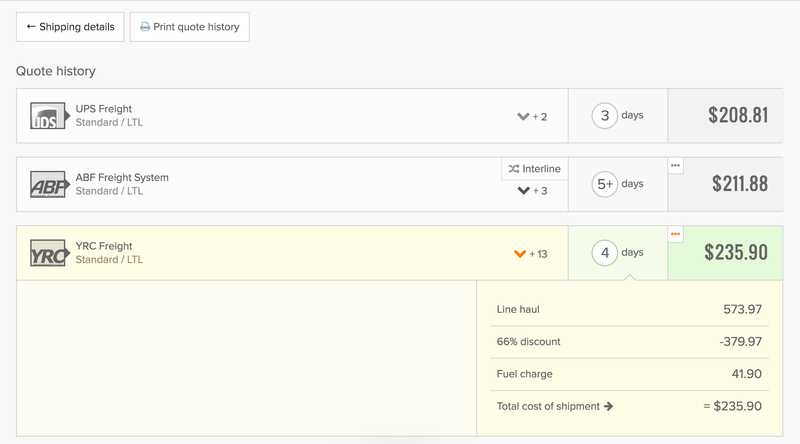 We’ll break out each charge, as well as show you your discount for each rate on a shipment. You can get to this charge information by selecting the three dots (“...”) next to the total. We’ll even add a line item for any markup you’ve added to a user, due to this, we currently don’t allow quote only users in Freightview to access this information. At the top of the rate list, we’ve added a toggle so that you can automatically expand this information for all your rates, as they come back from your carriers. We’re working our way through all of our rating integrations and adding support for displaying these charges, so we’ll be rolling out support for new carriers on a near weekly basis over the next few months. We’re starting off with support for 7 carriers and we’ll be prioritizing future carriers based on shipping volume. The carriers that support rate breakdown today are: ABF Freight System, A&B Freight Lines, Beaver Express Service, Estes Express Lines, FedEx Freight, Old Dominion Freight Lines, and YRC Freight. 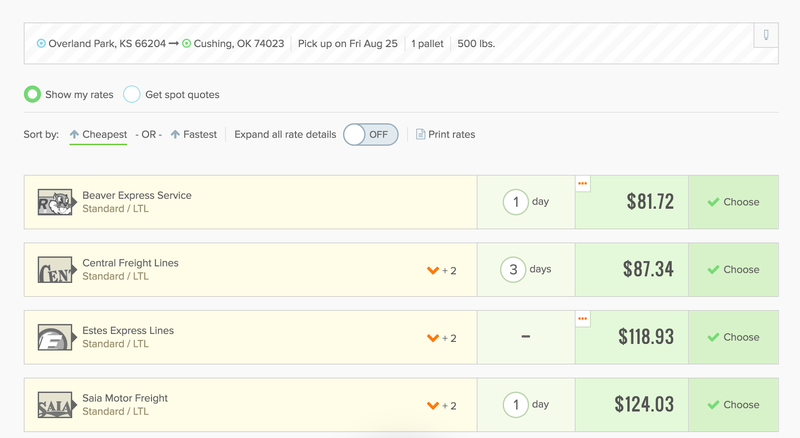 The rate breakdown is also available on a shipment that has been booked with Freightview by selecting “View other quotes” in the left menu of the shipment page. The rate that you selected will be highlighted and we keep this list sorted by price.